This post was filed under Pet Loss. 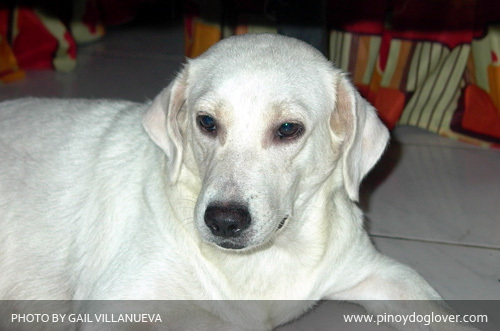 This was Whitey, an aspin and Labrador Retriever mix. She was my sister’s favorite. You see, my sister Joyce is schizophrenic. She doesn’t handle grief very well, so my family and I have to do our absolute best to support her and help her recover. The loss of Whitey was just depressing for her. Joyce and Whitey were best friends—my sister even allowed Whitey sleep on her bed even if when the needed a bath. She kept my sister company and made sure to be beside her whenever she seemed to be on a verge of an episode—her presence calmed my sister down. Whitey’s death was so sudden. Even the rest of us were saddened by what happened. She was alright one moment, the next, she was gone. But before she left, she made sure she was near my sister, but far enough not to cause her distress as she passed away. My dad found Whitey just outside my sister’s window—apparently, Whitey died quietly as my sister slept. Thank you, Whitey, for being the best friend my sister never had. We’ll never forget you. This entry was posted on Monday, January 19th, 2009 at 5:39 pm	and is filed under Pet Loss. You can follow any responses to this entry through the RSS 2.0 feed. Check out more doggie stuff from Pinoy Dog-Lover on Facebook! Iams Home 4 the Holidays exceeds adoption goals!